HONG KONG: Asian stock markets lost ground on Monday, with investors little moved by the G20's weekend commitment to boost global growth by $2 trillion over five years. After a weak lead from Wall Street Friday, markets were looking to a string of US data in the week ahead for clues about the health of the world's largest economy, with figures due out on housing, consumer confidence and GDP growth. 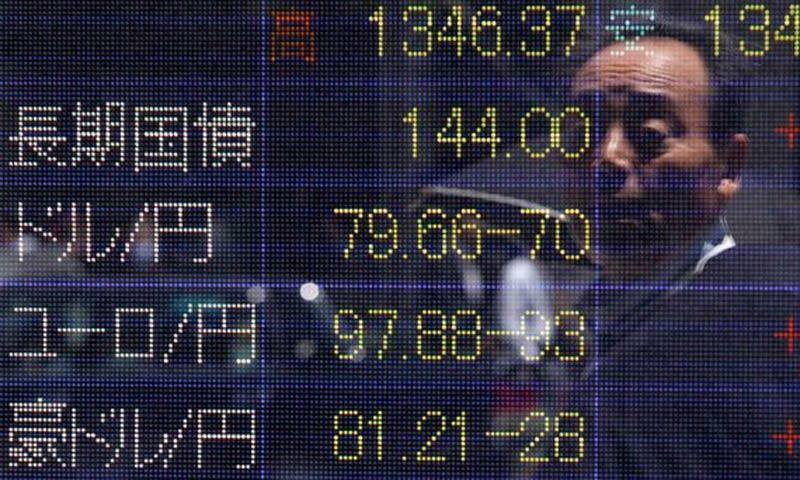 In Tokyo the benchmark Nikkei-225 index fell 0.19 per cent, or 27.99 points, to close at 14,837.68. Seoul lost 0.45 per cent, or 8.78 points, to end at 1,949.05 and Sydney closed a marginal 0.03 per cent, or 1.5 points, higher at 5,440.2. Hong Kong shares fell 0.80 per cent, or 179.68 points, to end at 22,388.56. On the Chinese mainland, shares extended losses on worries about possible tightening of credit to the property sector. Shanghai dropped 1.75 per cent, or 37.00 points, to close at 2,076.69. The Shenzhen Composite Index, which tracks stocks on China's second exchange, narrowed earlier losses to close down 0.07 per cent, or 0.82 points, at 1,134.19. China's domestic banks have recently tightened lending to the real estate sector, state media said last week, although the four biggest state banks on Monday denied any such moves. Official data released Monday also showed fewer cities, 62 out of 70 tracked, recorded month-on-month increases in new home prices in January, down from 65 in December. Analysts said fears were overblown. �The (property) market doesn't have any structural risks and the government wouldn't clamp down too tightly on an area so important for China's economy,�United Securities analyst Pei Xiaoyan told Dow Jones Newswires. The world's biggest economies vowed Sunday to boost global growth by more than $2 trillion over five years, shifting their focus away from austerity as a fragile recovery takes hold. The G20 members said they aim to lift their collective GDP by more than two percentage points over the next five years. However, investors appeared to be focusing more on the forthcoming US figures, as analysts suggested the data may disappoint. US February consumer confidence figures are due to be released on Tuesday, followed by data showing durable goods orders and initial jobless claims on Thursday. On Friday, the final estimate for fourth-quarter US gross domestic product is out. �It is possible that data to be released this week could come out lower than expected. Caution is needed over continued worries about the possibility of a US slowdown,� Tsuyoshi Nomaguchi, a senior strategist at Daiwa Securities, said in a note to clients. Nomaguchi said the US market could receive support from investors hopeful that weak data could encourage the US Federal Reserve to continue its zero interest rate policy. Japan will also publish a string of other data, including key inflation figures, on Friday. US stocks finished last week with modest declines. The Dow Jones Industrial Average fell 0.19 per cent, or 29.93 points, to 16,103.30 on Friday. The broad-based S&P 500 dropped 0.19 per cent, or 3.53 points, to 1,836.25, while the tech-rich Nasdaq Composite Index slipped 0.10 per cent or 4.13 points to 4,263.41. On currency markets, the dollar stood at 102.35 yen in afternoon trade in Asia, down from 102.49 yen in New York Friday. The euro was at $1.3765 and 140.89 yen, compared with $1.3734 and 141.00 yen. Oil prices rebounded in Asia owing to strong US demand driven by prolonged sub-zero temperatures across much of the country and geopolitical worries. New York's main contract, West Texas Intermediate for April delivery, gained 22 cents to $102.42 in afternoon Asian trade. Brent North Sea crude for April rose 20 cents to $110.05. Gold fetched $1,329.67 an ounce at 0905 GMT, after striking $1,332.45 late Friday � the highest point since October 31 � driven by strong Asian demand. � Manila fell 0.19 per cent, or 12.04 points, to 6,296.32. Megaworld Corp. bucked the trend to rise by 2.81 percent to 4.02 pesos while Ayala Land Inc. fell by 1.22 per cent to 28.40 pesos. � Wellington closed up 42.01 points, or 0.85 points, to end at 4,969.65 on positive earnings results. Freightways rose 2.84 per cent to NZ$4.70 and Sky Network Television City soared 5.74 per cent to NZ$6.08. � Taipei fell 0.48 per cent, or 41.25 points, to 8,560.61. Taiwan Semiconductor Manufacturing Co was 0.47 per cent lower at Tw$107.0, while Cathay Financial Holdings shed 3.04 per cent to Tw$44.7.